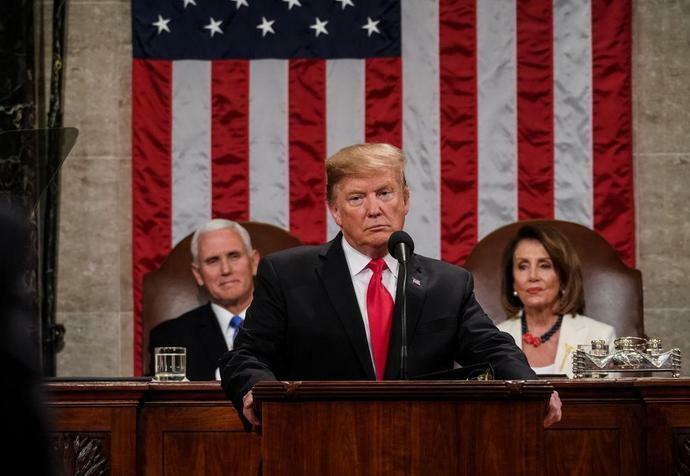 President Donald Trump delivered his second State of the Union address before a joint session of Congress on Tuesday night. The address was originally rescheduled for Jan. 29, but House Speaker Nancy Pelosi asked Trump to reschedule it in light of the partial government shutdown. The government reopened on Jan. 25 after Congress agreed to a 3-week funding stopgap, but the government could come to a halt again on Feb. 15 if Congress is unable to reach a compromise on a Homeland Security funding bill. During the speech, which lasted approximately an hour, Trump touched on many of his many favorite topics, including the dangers of illegal immigration and the strength of the economy. Trump made several digressions from the written transcript that shifted the meaning of what he said. For instance, while in the prepared speech Trump was supposed to say, "Legal immigrants enrich our nation in countless ways. I want people to come into our country, but they have to come in legally," he actually said, "Legal immigrants enrich our nation in countless ways. I want people to come into our country in the largest numbers ever, but they have to come in legally." The guests invited by the President and Congressional Democrats reflected the deep divisions in American politics. Trump's guests included three family members of a Reno, Nevada couple allegedly killed by an undocumented immigrant, whereas Democratic Sen. Jeff Merkley invited Albertina and Yaquelin Contreras, a mother and daughter who were separated for nearly six weeks by U.S. immigration authorities, and were later featured on TIME's Feb. 4 cover. Trump's speech was followed by a Democratic response by Stacey Abrams, who narrowly lost the Georgia gubernatorial race this fall but is considered to be a rising Democratic political star.